Suitable for cutting bones and frozen products in foodservice and food retail. Bandsaw for bone and frozen products with 215-300mm. cut height. 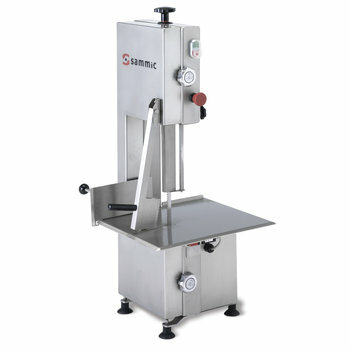 SH bone saws by Sammic offer not only a modern design but also a safe and simple operation. Totally made of stainless steel, Sammic bone saws are equipped with an accurate blade stretcher and a safety microswitch. They offer a simple and precise pulley adjustment system to adjust blade height and angle to ensure highly precise cuts. SH bone saws are complete with a detachable scrap pan and are very easy to clean. SH saws are certified in conformity with hygiene and safety CE regulations and specific product standards.